In the immortal words of Dave Barra, anything worth doing is worth over doing. This is the 24-page swim plan for today’s swim. It covers the basics of communication protocol, course description, vessel traffic avoidance, emergency and evacuation procedures, and rules. Thanks again goes to VTS Sector Puget Sound (Seattle) for taking the time to entertain this, and additional thanks to WSDOT Ferrys for doing to same. Step one: jump in. Step two: turn left and go off course. The actual route for this swim does not match the shortest route. The shortest route, at 18.8 miles, heads north from the start through the East Passage. My route is over 2.6 miles longer, and goes left around Vashon Island. During Bert Thomas’s 1956 swim in the opposite direction, he swam about nine hours before getting stopped by the tide and finally finishing seven hours later. That’ll happen in the East Passage, where the ebb and flood of the Sound creates noticeable currents, and complicated eddies. While it sounds like a complicated, exciting challenge to hop between shores, tuck in behind spits of land to fight the tide and then burst out at the right moment, when one adds in the shipping lanes running through the East Passage, more likely it would become another Tappan Zee incident (see Stage 6) where I’d be constrained to unfavorable water and left to fight it out. Instead, I’m going to avoid shipping traffic and, if I’m right, the tides altogether. Now not far west from the start along the shore of Point Defiance, regular swims with Melissa have taught me that the current there always pushes west. And Melissa’s birthday swim taught me that a strong clockwise eddy lies just north in Dalco Pass, midway between Vashon and Tacoma shores. So I’ll ride that current west from the start, heading out to the mouth of the Narrows to meet a ripping ebb tide pushing north into Colvos. 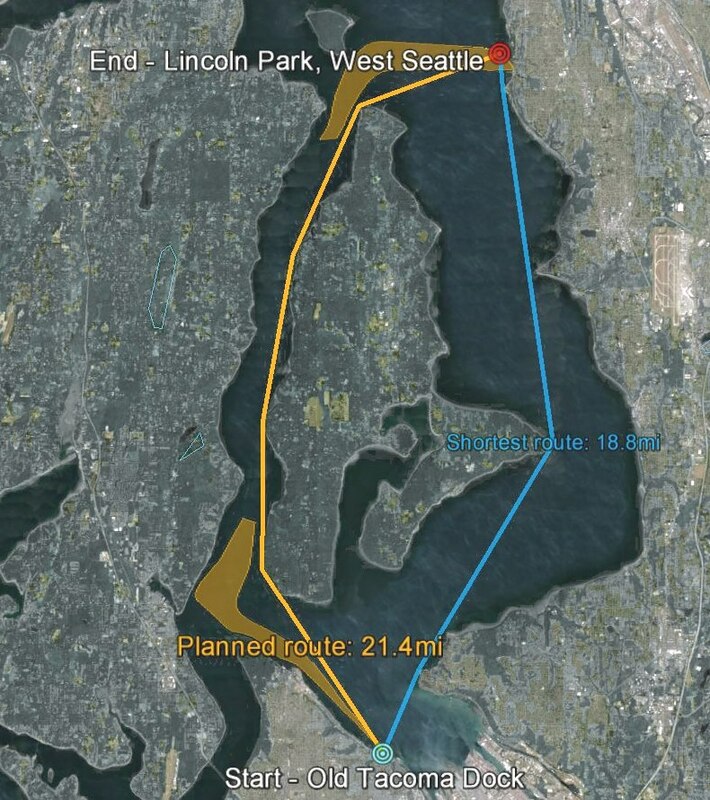 This part is a bit of a gamble; if I swim for the Gig Harbor Light fast enough, I should be pushed north into Colvos on the backside of Vashon. And that is where it gets beautiful. Colvos they say, by some magic of oceanography, always has a north current. So I’m adding a few miles to the swim in hopes of avoiding a seven-hour delay like Bert had. At the top of Vashon, we’ll ride the current as far north as possible, getting above the ferry lanes and preparing to swim due east against a flood tide pushing south.